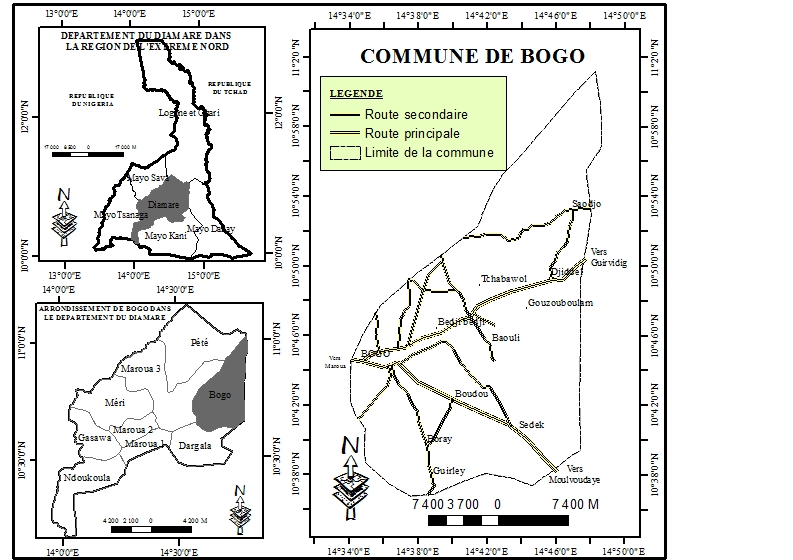 The landscape selected for the area of focus for COMDEKS activities in Cameroon is the Bogo region, located in the northernmost tip of the country. The landscape stretches across 93,000 hectares, incorporating the Sahelian zone of the Lake Chad Basin, as well as the western foothills of the Mandara mountains. This distinctive ecosystem is abundant in natural resources, including alluvial soils, diversified pastures, and a rich local culture welcoming to tourism. However, the region is also characterized by poverty and food insecurity due to low precipitation and poor water quality, and basic social service provision is weak. Deforestation and subsequent desertification, exacerbated by population expansion and fuel wood harvesting, as well as unsustainable agricultural practices are threatening the biodiversity of the remarkable flora and fauna of the region. The Bogo region is a mosaic of land-uses, combining the diversity of rolling hills, natural reforested areas, meadows, wetlands, water ponds, mango and guava plantations, as well as rural farmlands, pastures for livestock, and urban areas. It is home to a range of unique animal and plant species, including warthogs, hyenas, egrets, and African cormorants. The ecosystem is facing growing pressure human behavior, including the overuse of chemical fertilizers, bushfire practices, expansion of pastures, and deforestation, leading to desiccation of rivers, soil erosion and degradation, and ultimately, a loss of natural vegetation and wildlife. The Bogo target area has a total population of 95,230 which is comprised of the Mousgoum, Moundang, Massa, Toupouri, Kotoko, Mbororos and Fulani groups. 22% of the population lives in urban areas, with the remaining population spread throughout rural communities in the region. Poverty is widespread throughout the region, as extreme weather variability leads to endemic food insecurity and a dearth of potable water leads to the prevalence of water borne illness. Education levels in the region are poor, with only 4% of the population attaining education levels above secondary, while 63% of the population remains illiterate. However, the greatest challenge in the region is poor health stemming from the combination of unclean drinking water, the spread of waterborne disease through frequent flooding, and a warm climate favorable to the spread of certain diseases. As a result, malaria, meningitis, and hookworms are endemic throughout the region, leading to high infant mortality rates and low life expectancy. The primary regional economic activities are through agriculture, livestock, and fishing activities, and several products including cassava, sweet potatoes, millet, livestock, and fish are sold locally. However, the decline in agricultural productivity stemming from soil degradation and increased climate variability is increasing the vulnerability of local actor dependent on agriculture for survival. The baseline assessment was conducted with the participation of a range of community groups, local stakeholders, and representatives of local governments and civil society organizations in the Bogo target area. 214 men and 116 women, representing eight local cantons, participated in several workshops where participants used the SEPL indicators to evaluate the condition of the target landscape. Additionally, several focus groups were held with community leaders to discuss the unique challenges in the region, and 200 community members participated in a final meeting to discuss and formulate a local landscape strategy. Improved protection of ecosystems (wildlife habitat, water pools, hydro and watersheds) through better management of land and water (water conservation and soil), mitigating and reversing the processes of erosion and desertification. Strengthened agricultural and pastoral production systems with increased agro biodiversity and landscape resilience through the promotion of sustainable agricultural practices. Improvement of the livelihoods and well-being of communities through the development of sustainable income generating activities based on local resources. Strengthened institutional capacity at the landscape level, including integrated participation of stakeholders in decision making, as well as the establishment of structures focused on ameliorating endemic disease in the region. Projects that will be supported through COMDEKS in Cameroon will focus on the improvement of landscape connectivity and increased resilience. Supported projects could focus on agro-forestry activities and the restoration of degraded land, for example through the creation of nurseries, the restoration and protection of wetlands and ponds, and the introduction of soil conservation and waste management techniques. Other projects could focus on the collection and storage of rainwater and the establishment of small scale infrastructure for water retention and irrigation. Additionally, COMDEKS projects aimed at institutional capacity building might include the development and promotion of traditional species (such as the Neem seeds, oil and leaves) used in traditional medicine for the treatment of locally prevalent diseases including malaria and harmful amoebas. Finally, projects aimed at the integration of all stakeholders in decision-making, especially women and youth, the establishment of revolving funds to finance sustainable alternative activities aimed at women’s empowerment and contributing to landscape resilience will be supported. New! The COMDEKS Country Programme Landscape Strategy for Cameroon, in French, can be downloaded here. The Bogo region is home to a range of unique bird species that rely on the region’s wetlands during their migration cycles. Traditional fishing methods being employed in the ponds of the Bogo region.